It's my pleasure to welcome Regan Black back to the Dish today. I was introduced to Regan and her romantic suspense stories a couple years ago at Georgia Romance Writers' Moonlight and Magnolias Conference and I'm so very happy I was. Her action-packed, suspense-filled books, whether written individually or co-written with Debra Webb, never fail to take me on a heart-pounding ride. The USA Today Bestselling author also writes paranormal and urban fantasy. You can find more information about Regan and her books at her website and connect with her online at Facebook, Twitter, and Pinterest. Hi, Regan! It’s a pleasure to host you here at the Romance Dish. 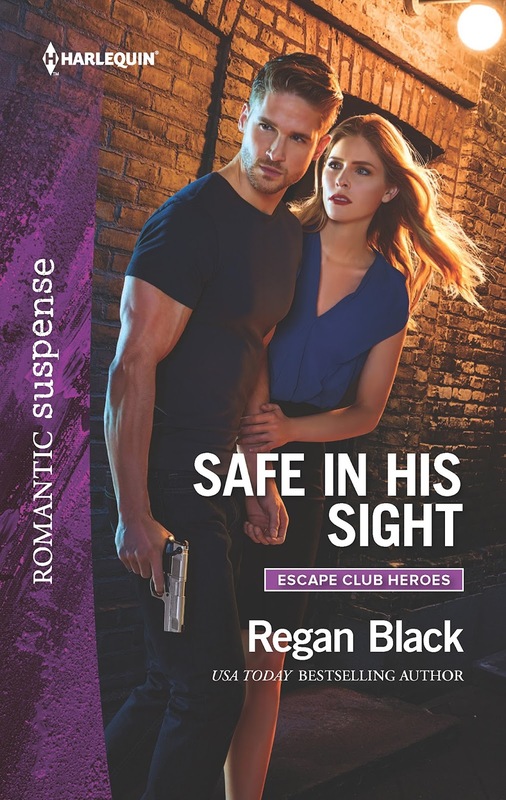 Congratulations on the release of SAFE IN HIS SIGHT, your debut novel for Harlequin Romantic Suspense. Please tell our readers what they should expect from this book. Thanks, for having me PJ! It’s wonderful to be here. Readers should expect an exciting, action-packed ride with Mitch and Julia. There’s (naturally) a great deal of trouble in Julia’s life when she feels her only option is to visit the Escape Club for help fending off a stalker. Mitch, a firefighter on administrative leave, is tending bar at the club when Julia walks in. Sparks fly from the start. 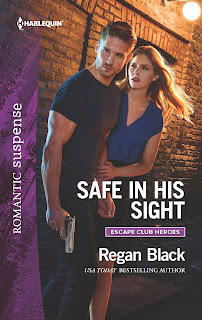 SAFE IN HIS SIGHT launches your Escape Club Heroes series. Please tell us a bit about the overall series. How many books will there be? 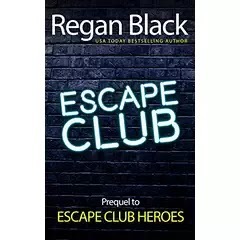 This series revolves around the Escape Club, established by a former Philadelphia, PA police officer who had to retire early after being shot in the line of duty. He set out to create an ideal hot spot for local bands, and the club became a refuge for first responders picking up work while on leave for various reasons. Because of the nature of the majority of the employees, the club also gets a reputation for assisting people who have trouble that slips through the cracks of typical law enforcement responses. In Julia’s case, she can’t wait for normal police procedure to resolve the issues the stalker is creating, so she goes to the Escape Club for help. Right now, there are four books scheduled for the series. There is also the short prequel Escape Club that released in July and covers how the club was established on the pier on the Delaware River in Philly. It’s possible I will develop more short stories for release between the novel releases, but that will depend on several factors in my schedule. You have some scary cyber criminality in this book. Did this come from your imagination or real-life crimes? What kind of research did you do for this facet of the book? Most of the premise for Safe In His Sight came from my imagination, although thanks to technology, we’re seeing cyber-stalking, cyber-bullying, and private data breaches more often. Because I’m blessed to have a husband and children who work with and understand cutting-edge computer and technical advances, my research usually starts with asking one of them a question about what might be plausible. Once I boil down that (often lengthy) answer, I go digging into various non-tech sides of the issue and go back with more questions, or track down another source or interview if necessary. Lather, rinse, repeat, and eventually the technical elements are clear enough to me that I can incorporate them into the story without detracting from the overall adventure and growth of the characters. I can always count on your books to keep me glued to the pages from beginning to end. What authors do you turn to when you want a riveting, can’t-put-it-down, read? When I need bigger-than-life action, I turn to Clive Cussler. For romance and romantic suspense, I’ll pick up books by Debra Webb, Nora Roberts and Carla Cassidy. Historical romance novels are my weak spot and Lisa Kleypas, Julia Quinn, Tessa Dare, and Sabrina Jeffries are must reads for me. Of course I love paranormal romances too and often return to my favorite Jayne Castle, Kresley Cole, and Nora Roberts titles to satisfy that craving. 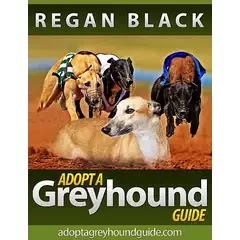 In addition to your romances, you’ve also authored non-fiction titles, including the Adopt a Greyhound Guide, about your experiences fostering and adopting retired greyhounds. Please tell us a bit about that experience as well as the groups that benefit from sales of this book. Oh, greyhounds are near and dear to my heart. So much in fact, that I’ve added greyhounds as characters in two fiction books (so far). When my husband and I got married a retired greyhound was our gift to each other. We both love dogs and the more we learned about this breed and their calm, couch-potato lifestyle after racing, the more we knew it was the right choice for us. They are sweet, funny, and expressive companions and they make excellent writing assistants. In our 25+ years of marriage there has only been one week when we didn’t have a greyhound in the house. As a family we’ve fostered somewhere around 30 greys and “failed” fostering (meaning we adopted greys intended as fosters) on five occasions. Currently, with every sale of the Adopt a Greyhound Guide, our family donates $5 to our local greyhound adoption program. This helps group volunteers with transportation and fostering costs as well as ongoing local and regional outreach efforts. At the moment I’m wrapping up my portion of the next Debra Webb and Regan Black novel for Harlequin Intrigue. There is such a fun energy when I’m working on books with Deb! After that, my agenda shifts to my Knight Traveler series with Timeless Changes - the fourth book - coming out in October. Later this fall I’ll be returning to my fictional night club in Philly and the next Escape Club hero. Thanks for visiting with us today, Regan! It’s always a delight to be here with you and your readers, PJ! We’ve talked about how I live my adventure through my books and with my greyhounds. How do your readers live their adventure every day? One randomly chosen person leaving a comment will receive a signed copy of Safe in His Sight. Deadline for giveaway is 11:00 pm, September 9, 2016. Vicariously most of the time. I'm not that adventurous, so I get my fix from reading. Isn't it great that the books we read allow us to go anywhere and try anything? When younger I had some adventures but I much prefer getting it through my books - the possibilities are endless (and safe lol). I had adventures in my younger years too though they were never of the physical kind. LOL - definitely much safer to be adventurous in reading. Thanks for stopping by today! Since I hurt my back last fall, I pass much of my time in my recliner reading! The new series looks good! I'm so sorry to hear you were injured, Debbie. Glad you have some good books to see you through! Right there with you, Janice! Thank you so much for this interview and feature, PJ! Yesterday and today, my biggest adventure has been whether the internet connection will last long enough to do what I need to do. My apolgies for the delayed replies everyone!